There are plenty of social networks around these days. You may not want to be involved on all of them. But it never hurts to reserve your favorite username across the most popular social networks. This is especially important for brands. Unfortunately, there are people who register branded names on sites such as Twitter. Namechk is a simple tool that lets you find out whether your brand name is still available as username at popular social networking and bookmarking sites. 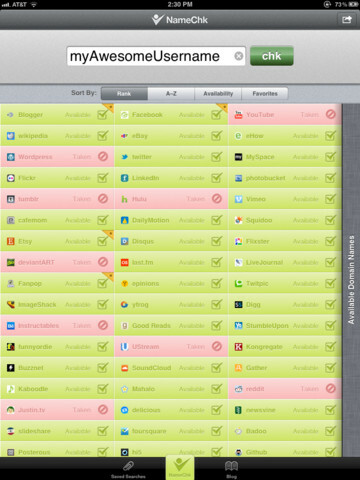 Namechk covers plenty of popular social networks. It makes the process of looking up usernames on them super easy. Just enter your brand name or favorite username and the app tells you whether it is still up for taking at the included sites. Doing this by hand can be quite time-consuming. 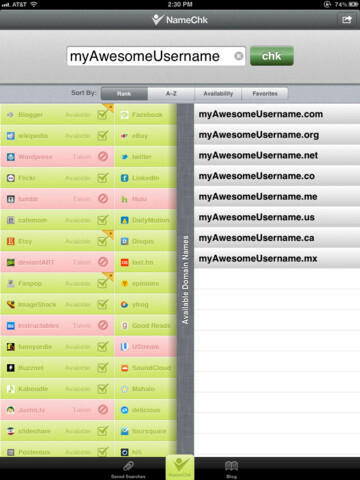 Namechk significantly reduces the time you have to spend searching for usernames across multiple social networks. Namechk has something for everyone. It saves businesses and individuals time finding great usernames. It is free too.